Summary: The bad news this week is that we found that the epoxy filler on the outsides of our hulls and all along the waterline is very soft and porous. 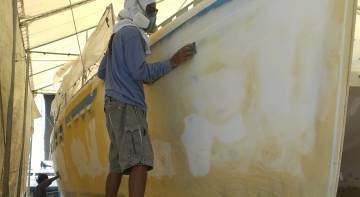 Whether sun damaged or poorly mixed, it ALL has to come off before we can start re‑contouring the hulls into nicely rounded shapes. Lots of sanding that we weren't planning on. But the rudder bearing project looks a bit easier than we'd thought, due to larger than expected rudder‑tubes. 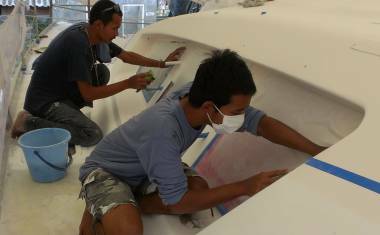 Baw and Nut made excellent progress and finished preparing the port side‑deck for gelcoat, bagging it in plastic to preserve their work. 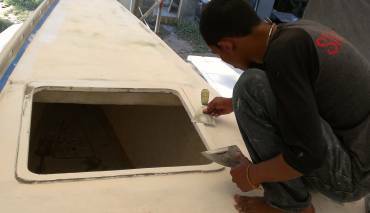 They also made good progress on the starboard deck, spreading filler on the hatch supports and sanding it smooth. Houa and K worked on portside, creating plastic‑wood strips for the heads and removing the rubber and plywood kick‑boards in the cabins, replacing them with formica. K cut his thigh and needed 7 stitches, our worst accident to date. 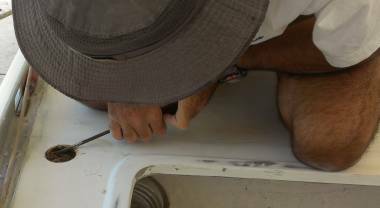 Jon found that West Epoxy pumps can be modified for our Epotek epoxy, which led to us applying phenolic‑epoxy mud to the starboard outside waterline. Two more applications were required before we had a nice, smooth transition from topsides to hulls. 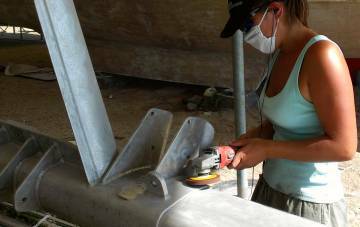 Sue and Amanda worked on polishing the spars and cleaning bits that need to be replaced. They also bought some epoxy paint from another cruiser, but it turns out not to be appropriate for nautical work. Jon repaired R2D2, our shop vac, and de‑cored our 2 water‑fill holes on deck. The starboard topsides were long‑boarded (again) and some filler was spread into some low areas. 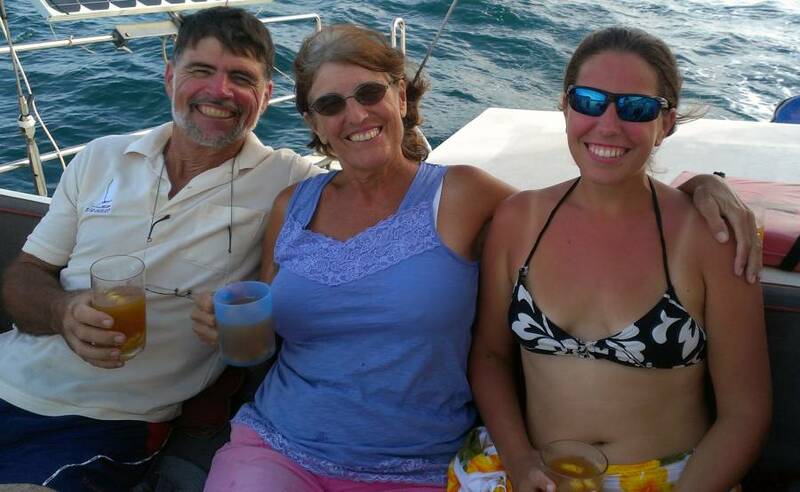 And we spent a wonderfully glorious Sunday out on the water, sailing to a neighboring island for some snorkeling. The good discovery involves the rudders. We've long known that our lower rudder bearings are inadequate. They only measure about 1.6" tall and 1.6" in diameter (40x40mm). These bearings are embedded in the hull, just above the rudder blades. We've now had the part of the rudder shafts just above the blades (the bearing surface) sleeved out to 2" (50mm) in diameter, with a bearing surface that's 4" (100mm) high. This should give us more than 3 times the bearing surface. We've also had our machine shop fabricate new lower bearings for the rudders, but we've been trying to work out how best to mount those bearings in the hulls. We'll need to remove the old bearings (which are now jammed into their holders) and the old bearing holders, which are aluminum. Inside Ocelot's engine room is a fiberglass tube that goes around the rudder shaft and joins the upper and lower bearings. We had originally thought that we'd need to cut that tube at the bottom and then join it to the new bearing holder, but today we found that the tube is actually much larger than we thought. It's large enough that we can bore a hole into Ocelot's hulls big enough to take our new bearings and if we're careful we'll still be entirely inside the tube! This could save us a ton of work. 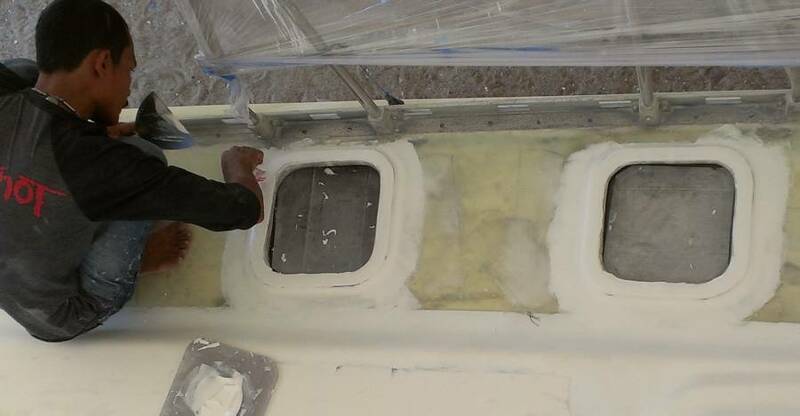 All we'd need to do is cut a hole just big enough for the new bearing (which will also remove the old bearing), epoxy the new bearing in place, and add some reinforcing fiberglass around the base of the rudder tube. Sweet! While we were futzing with the rudder bearings we decided to try an experiment. Our new rudder bearings are supposed to be made of Delrin, which is supposed to be stable in water (many plastics absorb water and swell, especially nylons). But Thai names for plastics aren't the same as ours, and we're not quite certain that we got what we wanted, and some folks have reported that Thai Delrin is not entirely stable in water. So we recorded the measurements of one of our bearings and then immersed it in water. We'll check it again in a few weeks to see if any of its dimensions have changed. We had what we've come to think of as our "normal" team today. 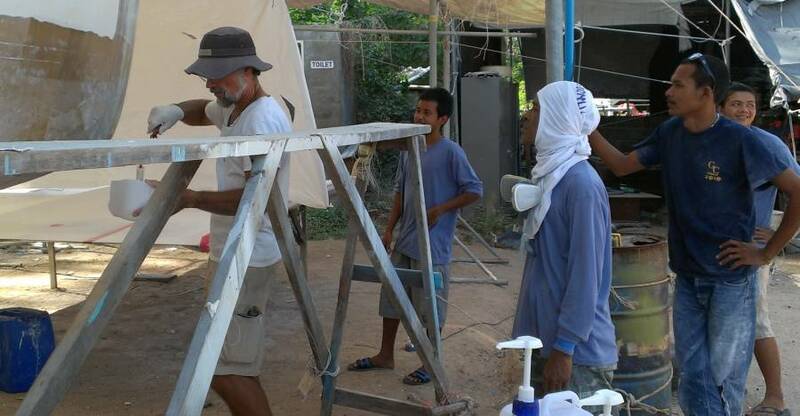 Houa and K were working inside the port hull, fitting bits of plastic wood into the bathrooms. Baw and Nut were working together on the decks, preparing the bows for gelcoat. They had to remove some of the old epoxy filler, but they quickly replaced it with some good filler and sanded it to shape. Jack and Lek had the nasty job of preparing the starboard topsides. They wanted to use rigid long‑boards, despite the fact that Ocelot's hulls are not flat anywhere - they're always curved, both horizontally and vertically. So we asked them to please use flexible long‑boards, so they don't just sand in one place. OK. Then they discovered the damaged epoxy and switched to big polishers with soft sanding pads. Things glided along pretty smoothly today. We had our normal 6 man team, although K left after half a day. It seems the idea of actually asking permission to leave, or at least telling us, is not part of this work culture! Baw and Nut continued yesterday's work on the foredeck on both port and starboard. Although Mike wants to shoot a whole side when he next comes, Baw prefers to make sure both sides are the same, so he wants to work on both sides at the same time. We can't fault dedication like that. Baw and Nut sanded the tops of the foc's'le and the new cabin hatch rims and smoothed them with filler so the fiberglass strands don't show. They also sanded around the "eyebrows" (the new deck lockers) to refine the shape. We had a few moments' panic when Baw announced that the new gelcoat wasn't sticking. Turns out that he was poking at the edge of gelcoat up on the cabin top that is not supposed to be well stuck down. It is in the area that was overspray from doing the gutters, and it will all be sanded back by Mike and the AME team when they come to put the nonskid on. On the starboard topsides Jack and Lek pretty much finished the removal of the old, sun damaged epoxy filler, and then worked on cleaning up the water/paint line. When we told them we were going to put epoxy on the paint line they began wiping it down with acetone. We had to put the brakes on, as Jon wasn't going to be there to get them started doing it the way he wanted. Dang. We hate to stifle their enthusiasm, but it's better than having to redo something that is done wrong. 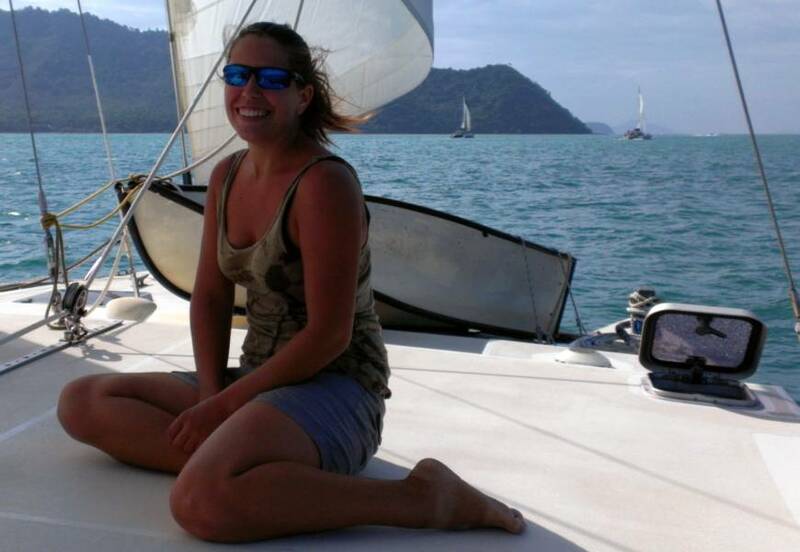 Amanda worked in the shade on port side of the boat most of the day. She had her earphones in, singing along to her music while grinding the forebeam in preparation for Nyalic. Sue retrieved the jib sail tracks from the storeroom and put in several hours removing the old silicone and corrosion so that they will be ready for mounting on the deck someday. Houa and K continued work on the heads and the sides of the port cabins which will get formica. After a nice Thai lunch with French cruising friends (who are about to cross the Indian Ocean) Jon scootered into town to buy a big hole saw to begin the rudder bearing project. 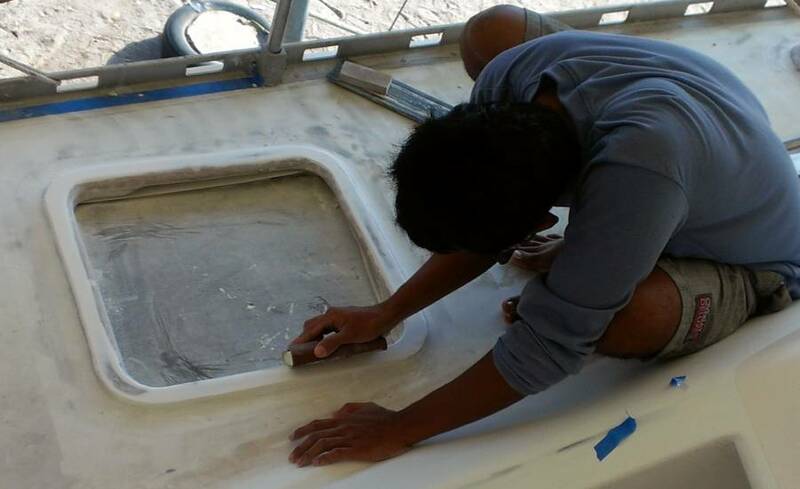 He also checked in with our headliner folks, and put in some time grinding off the sun damaged epoxy filler. That's HARD work! A busy day with our three teams all working different parts of the boat, and Team Hacking putting in good effort as well. Baw and Nut were the deck team again. They worked on the bows on both port and starboard, getting them ready for gelcoating. They sanded the rough fiberglass supports for the foredeck hatches, spread on a light layer of filler, then sanded them smooth They also laid some gelcoat on rough areas of the sides of the deck to avoid using the more porous polyester filler. By the end of the day, Baw had the entire port foredeck and bow covered in cling wrap plastic. We assume this means he has declared it finished. Houa and K continued their interior work. The small plastic panels that rim the lower edges of the doors to the heads are all assembled and ready for painting. We'll be using a 2 part epoxy paint that is supposedly tough as nails and impervious to water. The tall vertical panels don't need paint, as the plastic board wasn't breached, but the lower pieces have the rough interior of the board exposed. K used the grinder to take back the glue that held the rubbery wall covering to the hull, and unfortunately had an accident where he sliced his thigh with a box‑cutter. He stoically cleaned out the wound, and Sue made him a sterile bandage. We all thought that he needed several stitches, but we're not sure we convinced him to see a doctor. Baw pointed to a scar on his head and said, "See Madam. No problem." Right. And then Amanda thought of the Ma Song, the penitents in the Phuket Vegetarian Festival who pierce their faces with skewers and big sticks... Ok. Maybe a grinder cut is no big deal? We just hope he is OK.
Out on the topsides and hull, Jack and Lek made a good team working together to get the old yellowed epoxy off the waterline, both inside and outside starboard hull. After lunch Jon gave the whole waterline an extra zap with the grinding pad, then declared it ready for epoxy. Jon got to initiate his new pump system with the Thai Epotek epoxy (a 3.33:1 mix). Strangely, while Jon worked at pumping and mixing epoxy, then beginning to roll it on, it attracted all our workers who gathered round like opening day at the circus! Houa commented that it was the normal situation of 1 person working and 8 watching. After 1 layer of epoxy was rolled on and left to cure a bit, Jack and Lek used metal scrapers to apply phenolic filler to the waterline. This is waterproof filler, used at and under the waterline, as opposed to the white stuff which has porous micro‑balloons. By day's end, Ocelot looked like she had a thin strip of dark red/brown paint! Amanda and Sue both put in time grinding and sanding the aluminum forebeam and its brackets in preparation for Nyalic. Sue also got the second jib sail track cleaned up and all the silicone taken off so that it's ready to mount. We were happy to see that K returned to work today, with a thigh full of 7 stitches for a cost of 670 baht (about US$20) which we paid for. Yes, we saw the hospital bill! He was in good spirits and happy to show off his bruised leg. It hadn't been a grinder (thank goodness) but a box cutter that got him. Of course, as his friends and fellow workers were quick to point out, he'd been cutting thin strips of plywood on his lap. 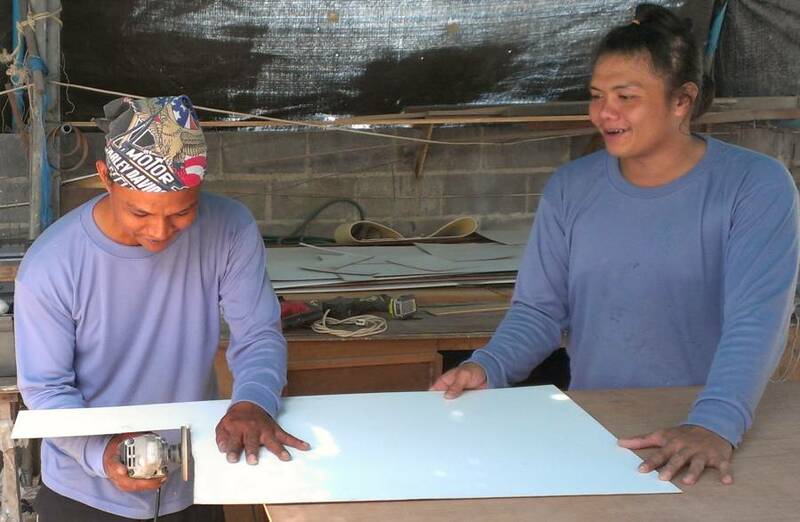 K and Houa continued the work on the formica in the port cabins, and produced plywood templates (just the outline) of each of the spaces, then cut the formica pieces. Houa wanted to either use epoxy glue or Sika to attach them, but both options seemed like overkill to us, as we had used contact cement yeas ago when we did starboard side. We compromised with a bit of Sika for the part of the formica that needs to slip behind some wood trim, and then contact cement for the rest of it. That's tomorrow's job. 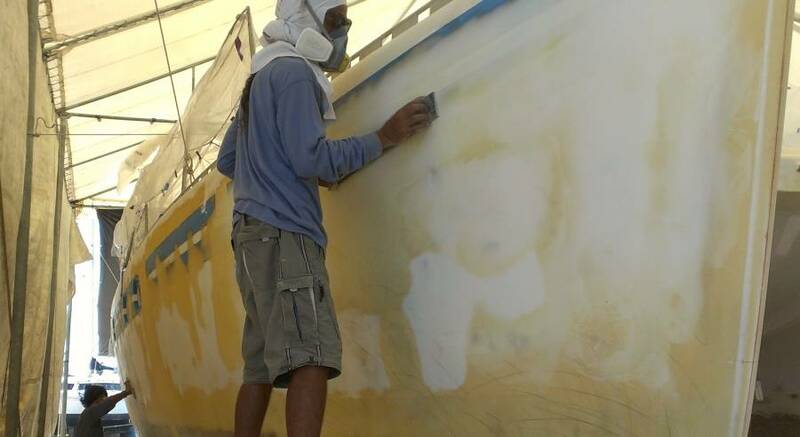 Lek and Jack used the dancing sanders sand down the new phenolic filler at the starboard waterline. This showed us that the old boot‑stripe was indented from the rest of the hull, as it remained shiny after sanding. 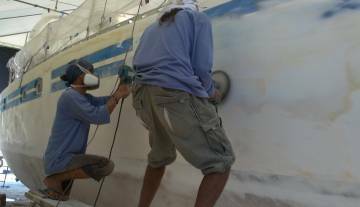 Just after lunch we were a bit shocked to see the guys preparing a batch of epoxy and phenolic, with the boot‑stripe area still shiny and un‑sanded. We stopped them, then grabbed sandpaper and blocks and started hand sanding the line ourselves. Lek joined in, but Jack took a few minute break. When we brought Cris over to help translate he told the guys what we wanted. 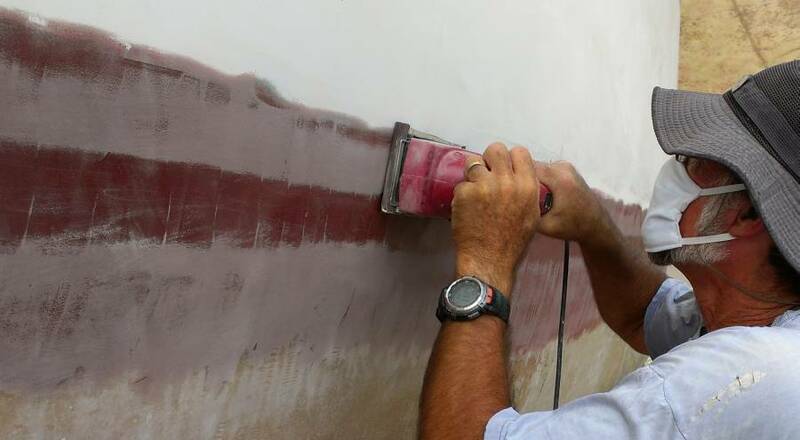 But when we tried to ask why they had begun to mix the new epoxy without having sanded, Cris shrugged and said, "Stop worrying about the reasons. Just tell them what you want them to do. They have always done it another way, but I can just tell them to do it your way." OK. Our way it is. Amanda, Jon, Lek, Sue and Jack had the whole phenolic line sanded in about half an hour. Too long for the epoxy/phenolic mix as it had hardened up, so one pot tossed out. After they got the newly sanded line re‑covered in phenolic, Baw joined in and made a long, flexible paddle tool. After Jack blobbed the phenolic thickly onto the transom extension, Baw wrapped his plastic tool around the hull to smooth the phenolic into long sheets that conform to the hull's shape. This was not supposed to be a matter of "nit noi" (very little) filler, but a case of filling flat places on the new hull and shaping the underwater extension to match the topsides. Most of the day Baw worked with Nut up on the decks. They re‑shaped the rims of the deck hatches so that they're all the same, with a nice downward slope. Then they put gelcoat (as opposed to porous polyester filler) around the rims to give the area a good, smooth base before spraying. They also worked on the port cockpit side seat, the big one where we usually have blue cushions. Several parts of that had been water damaged, and we'd had to replace the balsa with foam, so there was some leveling and filling to be done. Amanda and Sue put some more time in on the aluminum mast and forebeam fittings. 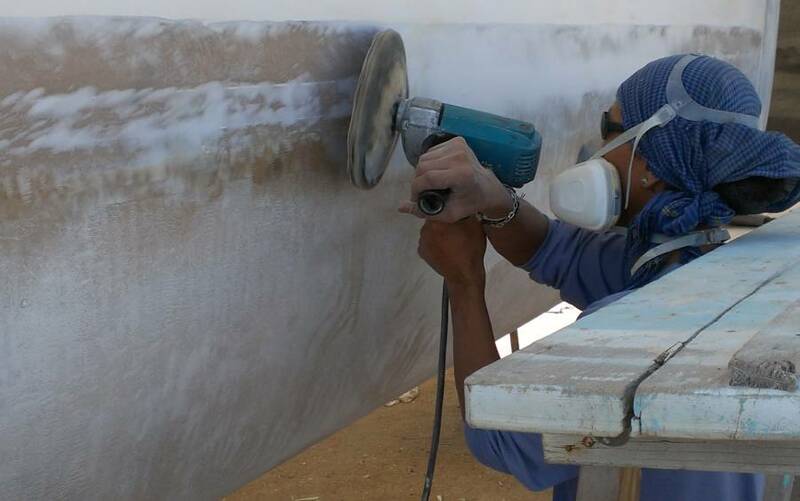 Working downwind of grinding and sanding is never a good idea, so their working time was dictated by when the machines were silent. The week has flown by and it's Friday already, but not the last day of the week. Apparently 6 day work weeks are standard in all but Thai banking and government jobs! Same teams today, with Baw and Nut making great progress preparing the port deck for gelcoating. They sanded around the big window on port side, and double checked the fairing of the deck itself and the hatch rims. By early afternoon they had cling wrap taped over their work, meaning "Keep Off!" Then they moved to the port sugar‑scoop, which had received a coating of Thai gelcoat weeks back, and Nut had spent days fine‑tuning it and filling any little pinholes or defects. The guys got cool and wet with the hose and 240 grit sandpaper for a couple of hours. Our main push was on the starboard topsides, with Jon contributing muscle and energy to the waterline phenolic with the dancing sander. That's HARD work! 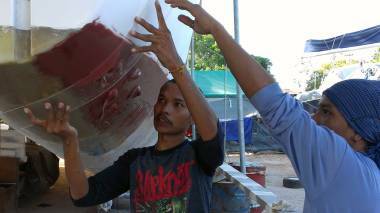 Jack and Lek concentrated on preparing and filling any low spots with polyester filler. This replaces the poorly mixed epoxy filler that was put on months ago by the previous teams. We are promised 2 more workers tomorrow, and with 4 men on the starboard topsides we expect this filling and fairing to be done within a week. Can't wait to see the gelcoat on the topsides! Houa and K climbed in and out of the emergency hatch on port hull, thus avoiding the wet filler and sanding dust up on deck. This gave them direct access to the portside cabins where they got at least one of the 2 big formica panels glued in place against the hull. Sue and Amanda had a frustrating morning when they tried using a new 2‑part epoxy paint on Houa's little plastic panels for the heads. We should have done a test patch but obviously can't heed our own advice. 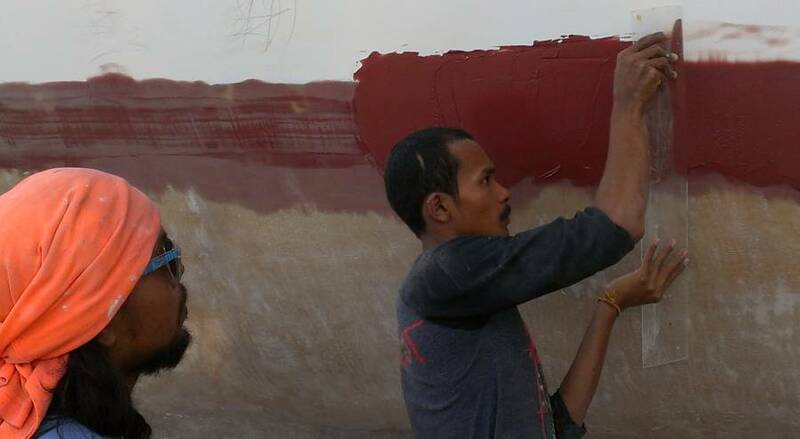 The paint, by Nippon, is nominally for houses, but several cruisers have sung its wonders, saying it's tough and sticks like crazy to anything. It was left‑over from yachty friends and we bought it. Now we're sorry we did. It may be great in lockers and bilges, but for a visible, nice application it was dead wrong. It was too thick to be applied nicely with a brush, and didn't roll on very well either. We tried thinning it but we still weren't satisfied. Sue ate humble pie, and apologized to Houa for messing up his fine carpentry. But he was his usual cheerful self and said that Baw would sand and re‑paint them with the spray gun. "No problem, Madam!" Right, well, we were trying to reserve Baw and his talents for other things, but maybe we do need his painting talents as well. After lunch, Amanda picked up the grinder and polishing wheel and Sue grabbed the sandpaper and a bucket of water, so they did accomplish something worthwhile. We now have a sanded, ready to Nyalic prod, and more polished aluminum on the forebeam and spreaders. In the late afternoon Jon took apart R2D2, our cute little shop vac. It stopped working a few days ago. Jon eventually found that it has a broken power cord, which should be easy enough to repair or replace (the guys can be pretty brutal to power cords). 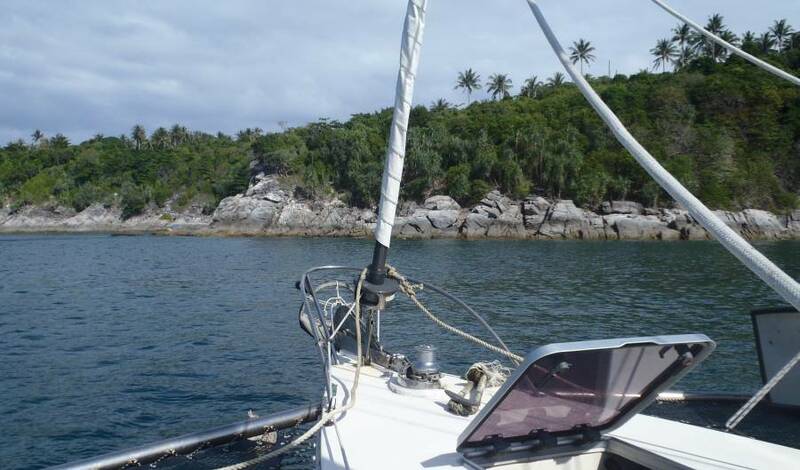 The plan was to get some Nyalic on the aluminum spars on Sunday, but we've just had an invitation to sail with friends out to the Racha Islands on Sunday, so ... guess which plan has more appeal? Saturday at last, and the week has a good "got things done" feeling, even though we had no more gelcoat sprayed on. Sue and Amanda got down and dirty and "aluminated" when they put time in on the boom and spreaders. Amanda was the polishing queen again, of course. And Sue did the manual sanding with 240 grit to get rid of the small dimples from the polishing. Jon got R2D2, our little shop vac, fixed with a new power cord. We bought the shop vac within weeks of our haul‑out, when we realized the guys use a blower to clean up dust and fiberglass. Yikes! No way did we want that happening inside the boat! And there are lots of times we don't want the stuff blowing around outside, either. R2D2 has been a good buddy and we're happy to have him back in service! 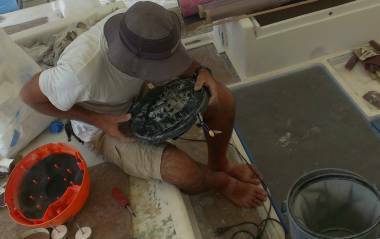 Then Jon started de‑coring the starboard water‑fill hole. This was cut several weeks ago and Nut smeared some epoxy in it, but the epoxy never cured and the balsa hadn't been removed far enough back from the hole for the screws that hold the deck‑fitting to the deck. So Jon got to spend some quality time with a chisel, long screw‑driver, and hammer, digging out uncured epoxy and balsa. Port side probably also needs attention, but it's under cling‑wrap right now. We got 2 additional workers today, Chai and Yoong. They joined Lek in long‑boarding the starboard topsides with 60 grit paper and flexible long boards. The nominal team leader, Jack, was home sick. 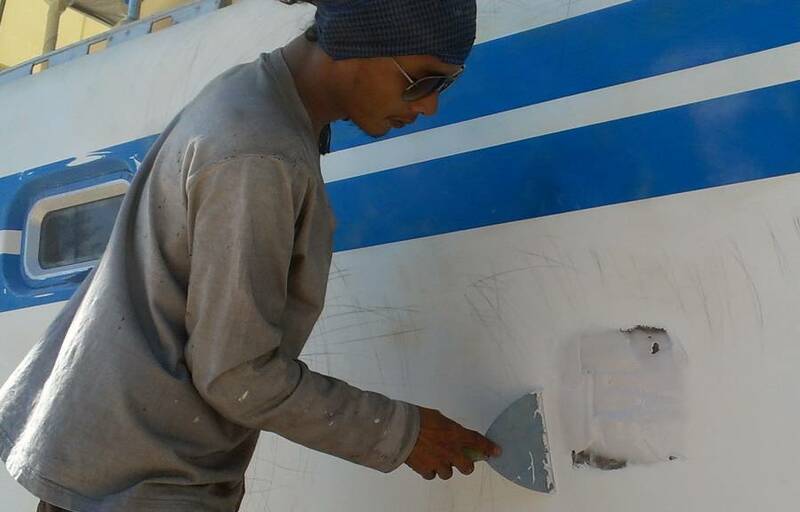 They marked the hull with pencil (we put a stop to spray paint marking when we realized that sometimes the acrylic paint is left underneath the filler!) Then they spent the day building arm muscles as they sanded in big circular motions all along the hull, trying to remove all the pencil marks. Up on the starboard bow, Baw spread new filler on, let it harden, then sanded it smooth. He is the master at creating the shapes, and we wanted him to be in charge of the new bow shape on Ocelot's slightly extended bows. Now he's working to get the bows nicely rounded. Golf had them cut off pretty square, which completely negated the reason we had them extended (we wanted a finer entry). Nut spent the day on the deck, getting the starboard deck hatch supports sanded and fillered and re‑sanded. Oh yes, there was an acetone step in there as well! It's all looking really good and we're hoping for a cling wrap‑up next week, saying that area is ready for its gelcoat "gutter spray" by Mike and the team from AME. Houa and K finished the formica in the port cabins and have the panel for the starboard aft cabin cut and edge‑sanded and ready for installing on Monday. K began pulling out the water damaged plywood from under the floor of the port aft cabin. These short strips will be quick to replace, and it'll be nice to know we're standing on solid wood, not soggy wood! About 3pm Baw and the topside guys dug out the epoxy and wiped down the starboard outside waterline with acetone. That waterline still has some dips and needs a bit more filling. With Jack out sick, this time Chai smeared on the filler and Baw used a plastic sheet to smooth (scree) it onto the hull. This has the advantage of getting very close to the correctly curved shape, but what it leaves behind isn't as smooth as using paddles. It will need some sanding and probably one more thin swipe of filler before the waterline is completely fair. After work, Cris scheduled a meeting with all the workers. We're not sure what was on the agenda, but part of it was supposedly telling them that they need to arrive by 8am so they can eat breakfast and start working by 8:30. And they need to work until noon before knocking off for lunch (our guys often knock off at 11:45). And they need to work until 5pm before they start to clean up. He's trying to get the yard working better for us, which is certainly welcome. We had a completely wonderful Sunday. Our friends Bruce and Alene on their big Cross trimaran Migration, invited us out for a sail. It was a sort of "celebrate sailing while we can" event because Migration is due to be hauled out for a big refit soon. Along with Bruce and Alene, and the 3 of us, we had Mike and Sue from Infini who are hauled out up in Boat Lagoon. Migration and Infini both have extensive and fun websites. 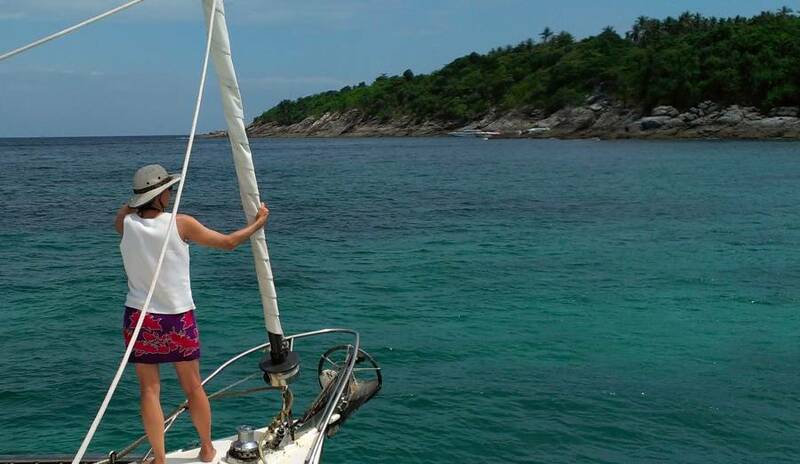 We had a glorious blue sky and 12‑15 knots of warm wind - a delightful winter day in Thailand. Recalling previous Februarys, this wind was unusual, so we guess we were pretty lucky! 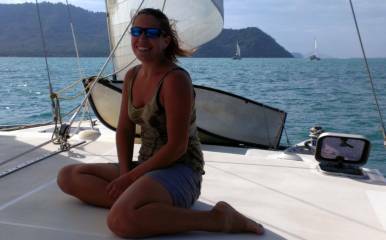 We sailed (yes, SAILED, not motored!) 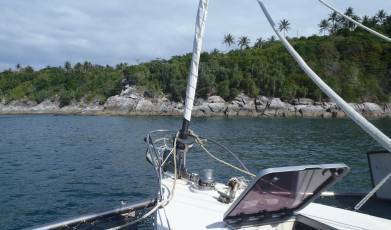 across from Ao Chalong to lovely Racha Yai Island about 12 nautical miles away. We were concerned that we'd be inundated with day trip power boats and a gazillion snorkelers and divers, but it seems the charter boats prefer the bay south of the one we chose, so we had a good mooring and no other boats nearby. We picked up a vacant mooring and the line was barely dropped over the bow cleat before all of us were in the water and off snorkeling. Oh, gloriousness! Cool, beautiful water! 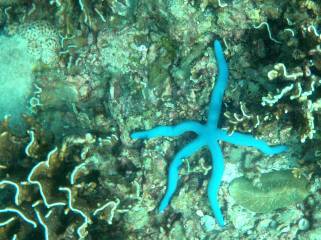 Not the clearest of conditions, but we had good viz to the coral 20‑30' (10‑15m) beneath us. Lots of nice little angel and butterfly‑fish. 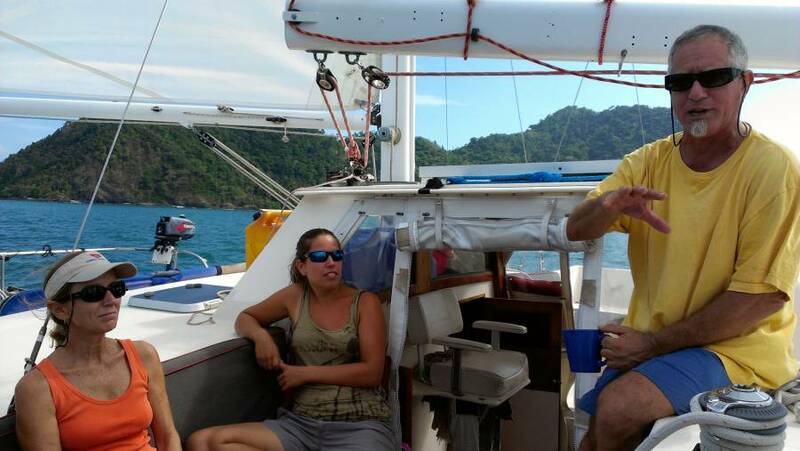 We had a an awesome picnic lunch up on deck in the shade with lots of tasty tidbits brought by all of us. Jon and Bruce even shared a Fiji Bitter, which we'd last had in 2005! 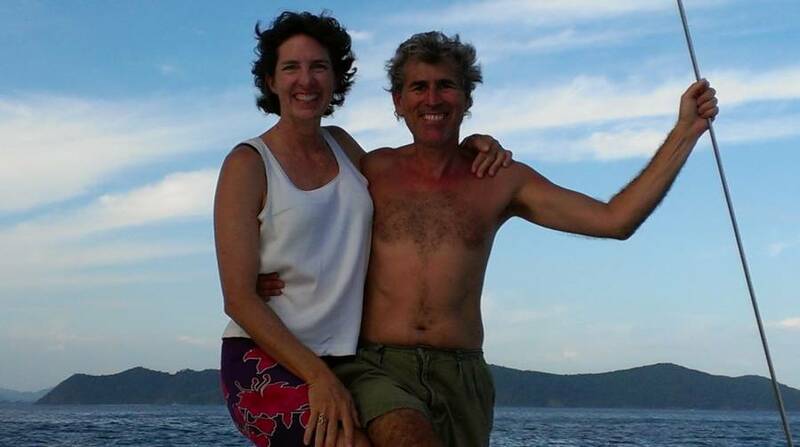 Migration has just sailed up from NZ via Fiji. 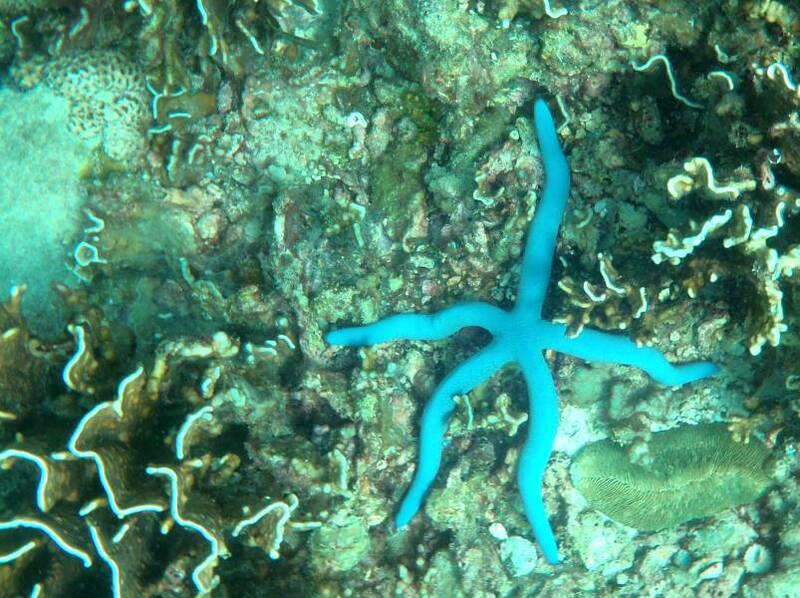 Then we hit the water again for another refreshing snorkel. Goodness, we've missed this. Sitting in the sun to dry off, or in the shade of the awning to talk about this and that, sharing ideas and solving problems or just getting to know each other. Bruce and Alene want to haul Migration for a good refit, and they're trying to decide who should do the work and where to do it. They will do much of the work themselves, as cruisers usually do, but like us they want some done by others. Our return sail was dreamlike. During lunch the wind had clocked around a bit, giving us an easier angle home. It was so protected in our little bay that we weren't even sure we'd be able to sail back, but we put up all 3 sails anyway. We ended up with about 12‑15 knots of wind from the beam, and Migration scooting along doing a smooth 7‑9 knots! Bruce made us fresh rum and fruit juice drinks, which is apparently one of his specialties. Goodness, we have missed this so much! Back in Ao Chalong we all gathered at Fon Fon Restaurant for a tasty Thai dinner and more stimulating conversation. A truly soul‑refreshing day, especially for folks who haven't been out on the water for WAY too long.